Who Made Who's saleability in his offspring continues to be unequalled. 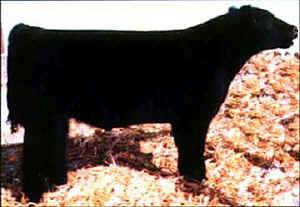 While many new sires will try to duplicate Who's successes with slightly different versions of what they claim will be the ultimate answer. Who Made Who's uniqueness in the amount of style he sires, the great neck extension he puts in his offspring, and the great hair few (over the past years) have ever offered, will send many a young sire back to the pastures as only nice clean up bulls. DEPEND ON, WHO MADE WHO!